For a temporary escape from the scorching heat and to relax, swimming is a great activity you can indulge in. It not only helps you stay cool but also contributes to your fitness. 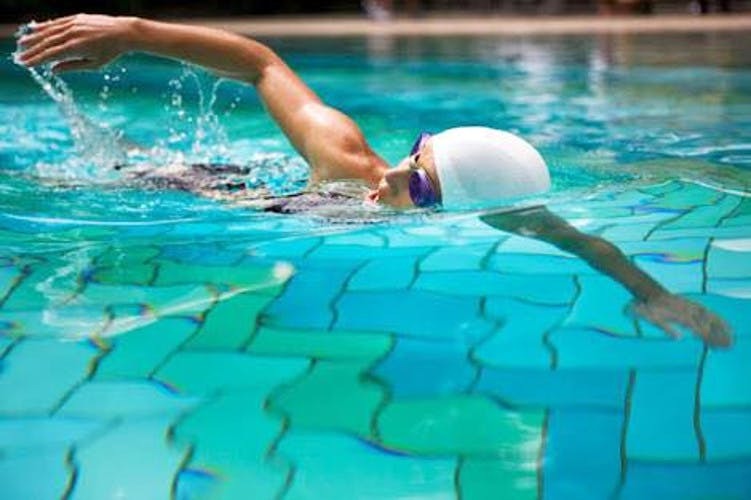 So, here is a list of swimming pools in the city where you can enjoy at reasonable prices. Located behind Image Garden in Madhapur, this indoor swimming pool allows members as well as non members. The memberships can be monthly (INR 2,200), quarterly (INR 5,600) and half-yearly (INR 9,500) whereas non-members can avail the pool for a mere INR 150 per hour. The swimming pool is adjacent to Gossip Coffee Shop which serves amazing filter coffee and Maggi too. A reputed fitness hub in Narayanguda, Praxis has a well-equipped gym, spa, and a swimming pool. The cleanliness factor is strong at this place, and they charge a monthly fee of INR 3,500 for swimming coaching, and INR 2,000 if you already know the sport. Non-members can have access to the swimming pool for INR 200 per hour. They have exclusive batches for ladies as well as general batches. At this luxury hotel near Tank Bund, get a membership for INR 9,000 a month and enjoy unlimited hours in the pool. You can also make use of the pool here for INR 1,000 (plus taxes) for a day and access it between 6am-10pm. If you’re serious about your fitness and want to take more steps towards it, you can also join their health club membership that has gym facilities, steam, and a pool for INR 6,000 (plus tax) on a monthly basis. Oyster Swimming Club in Madhapur has an indoor pool where you can swim on an hourly basis for INR 2,200 a month, and you can get swimming caps, and glasses right there too. Non-members too have access to this pool and the showers, and they can avail it for INR 150 per hour. Ellaa Hotel on ISB Road in Gachibowli also has a membership for its spa, gym, and pool facility. To spend a day swimming at the pool here, it will cost you INR 590 and for membership, the prices are INR 9,000 (plus tax) which includes the indoor temperature controlled swimming pool, a fully equipped fitness centre and you can also avail a discount of 20 per cent on the food and beverages here.